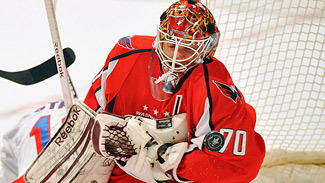 Either the New York Rangers or Washington Capitals will keep their Stanley Cup hopes alive with a win on Saturday night. However, history says neither club should worry about planning a championship parade next month. The Rangers and Caps will square off in Game 7 of the Eastern Conference Semifinals at Madison Square Garden, with the winner advancing to the conference finals against the New Jersey Devils. It's the second time in as many series that both the Rangers and Capitals have gone to the limit -- New York had to go seven games to beat Ottawa in the first round, a game that took place one night after Washington eliminated Boston in seven games. Saturday's winner may be one step closer to the Cup, but history says they won't get there. Since the Stanley Cup Playoffs went to a best-of-seven format for all four rounds in 1987, no team has won the Cup after having to go to seven games in each of the first two. In fact, last year's Boston Bruins became the first team since the 1992 Pittsburgh Penguins to win it all after surviving a seven-game series in the opening round. No matter which Eastern team makes the Final, it will be trying to match that achievement. The Devils needed seven games to beat Florida in the first round -- though New Jersey earned some rest by beating Philadelphia in five in the second round. Last year's Bruins are also the only team since 1987 to win the Cup after having to go to seven games twice during the first three rounds. Boston sandwiched a second-round sweep of Philadelphia around seven-game victories against Montreal in the first round and Tampa Bay in the Eastern Conference Finals -- then had to go seven games for a third time to beat Vancouver in the Final, making the Bruins the only team to win three seven-game series in one year. In theory, a team could play as many as 21 games to reach the Stanley Cup Final. In reality, no team has won the Cup after playing more than 18 games in the first three rounds. Boston played 18 last spring on the way to the Final -- as did the Canucks, though Vancouver had to go seven games just once in the first three rounds. The Bruins' 18 games are the most for a Cup-winner since Carolina also needed 18 to reach the 2006 Final. Detroit (2002 and 1998), Colorado (1996) and Pittsburgh (1991) also needed 18 games to get through the first three rounds before winning the Cup. Of those five teams, only Carolina needed to go seven games to win the Final. The '06 Hurricanes and last year's Bruins hold the record for most games needed to win the Cup with 25 -- although two teams have played 26 without going home as champions. Both the 1987 Philadelphia Flyers and the 2004 Calgary Flames lost Game 7s in the Final; each was playing its 26th game of the spring. In contrast to the East, both Western finalists are well-rested. Los Angeles is trying to become the first winner since Tampa Bay in 2004 to take home the Cup after needing just nine games to get through the first two rounds -- the Kings beat Vancouver in five games and swept St. Louis. Phoenix needed six games to beat Chicago in the first round and just five to knock off Nashville in the second. Only one team since 1987 has swept both of its first-round series. The 1988 Edmonton Oilers won their first two series in four games and lost just once on the way to their fourth Stanley Cup in five years. The Oilers' total of 17 games (not including a 3-3 tie in Game 4 of the Final in a game suspended due to a power failure) is the lowest of any Cup-winner in the last 25 years. The '88 Oilers are also the only team that won the Stanley Cup by playing fewer than 20 games. Since then, every winner has played 20 or more times; the last to play as few as 20 were the 1997 Detroit Red Wings, who ended their 42-year championship drought by sweeping Philadelphia in the Final. The Wings completed a repeat the following year by sweeping Washington -- the last time a Cup-winner hasn't lost a game in the Final.